This is an easy way of jazzing up rice and works well with the Accidental Locavore’s Shrimp la Vieuda. You can use any combination of things that suit your fancy. This will serve 4 as a side dish. 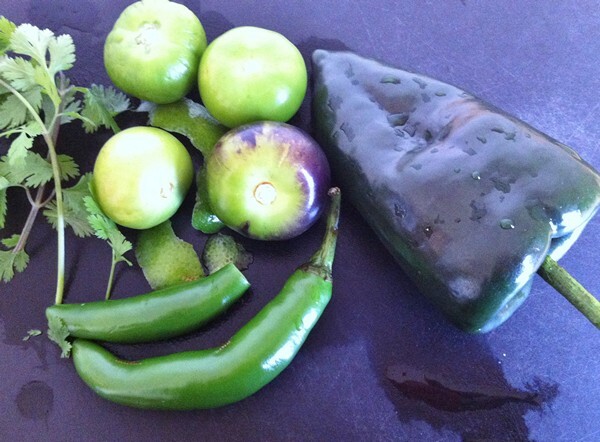 The Accidental Locavore shares an easy recipe for a tasty side dish, Mexican green rice. This vegetarian side dish is an easy way to jazz up rice. In the work bowl of a food processor, add all the ingredients except the rice. Process until the veggies are pretty finely chopped. Pour into a small saucepan and heat over high heat until it comes to a boil. Reduce heat to a simmer (the lowest setting your stove has) stir in the rice and cover. Cook for 20 minutes or until all the liquid is absorbed and the rice is tender. Stir, serve and enjoy! Notes: There are a lot of things you could add – epazote, Mexican oregano, mint, lime zest, are all possibilities. If you’re heat-averse, omit the serrano or jalapeno. Diana Kennedy sautés white onion and the poblanos before adding them. Rick Bayless mentions adding peas towards the end. They both toast the rice before cooking it (like pilaf or risotto), but I’m lazy and this is how I’ve always made it. Previous post: Suffering From Appliance Envy, Courtesy of LG! Next post: Accidental Locavore Top Things Too Stinky to Cook?